India is a country with more than one billion people and more than one hundred, often mutually unintelligible, spoken languages. It is a country of cold snowcapped mountains, tropical jungles, deserts and beaches. It is a religiously diverse country, being home to ancient and medieval Jewish, Christian, Hindu, Buddhist, Jain and Muslim communities. India is also home to several martial arts, more than can be adequately written about in this article but I will share two and the first in Kalarippayattu. Kalarippayatu is from Kerala, India, a small region on the southwest tip of the subcontinent. Kalarippayatu is very different from one might expect from Asian and Western martial arts. One unique feature is the nature of the training facility, the kalari. Part of the gym is dedicated as a shrine to various Hindu gods and patron saints. When one joins a kalari, one must first undergo a ritual initiation. Part of this initiation involves praying to the Hindu gods, touching the instructor’s feet as a sign of deep respect and being wrapped in the fighter’s loin cloth. Some kalaris also require new students to undergo an extensive massage, sometimes for several weeks, performed by the master, using only his feet. This is supposed to loosen the muscles, so as to prepare the martial artist for future training. Kalarippayatu training has essentially four levels: meithari, kolthari, ankathari and verumkai. Meithari involves stretching, yogic stances, jumping, twisting and other callisthenic exercises which focus on flexibility and speed. After a modicum of fitness is attained, the student begins training with wooden weapons, kolthari. Unlike Escrima, which focuses on single, slender, one handed sticks; Kalarippayatu uses thicker two handed wooden weapons such as the mace and club. Weapons training usually take the form of two man forms and not live sparring sessions. After proficiency has been attained in wooden weapons comes ankathari, bladed weapons. Kalarippayatu blades range from daggers, swords and brass knuckle type, Wolverine looking, punch knives called “katar”. Though sparring takes the form of two man sets, where practitioners take turns striking each other’s shields, Kalarippayatu practitioners use dangerously sharp blades. The weapons strikes in this style involve wide circular movements and sometimes accidents do happen. The final stage of Kalarippayatu training is verumkai, hand to hand combat. Kalarippayatu hand to hand techniques are theorized by some to be a major influence on “northern styles” of Chinese Kung Fu, because of their long range, circular, attacks. Kalarippayatu hand to hand techniques derive power not from physical strength or body weight but from spinning. The propensity for spinning attacks involve crescent kicks, sidekicks and palm strikes. Some of Kalarippayatu techniques seem to be for demonstration purposes only, as some of the throws land the opponent on all fours, as opposed to judo were one throws the opponent on their back, assuming they know how to break their fall. Though once outlawed during British rule, Kalarippayatu is making a comeback; it is in some ways a martial art frozen in time. Another Indian martial art is Kushti wrestling. At first glance, Kushti looks like Olympic Freestyle wrestling, in a sand pit and without wrestling shoes. Kushti wrestling is also called Pehlwani and its training methods are thought to have their origin in Persia. Unlike Kalarippayatu, conditioning focuses on strength and not acrobatic agility. Interestingly, the mace Josh Barnett sometimes uses in his strength training comes from this art, something he learned from the late great Karl Gotch. 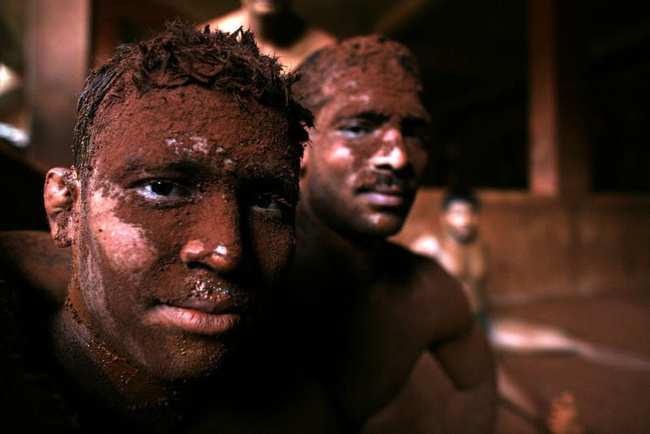 Like sumo wrestlers, many Kushti wrestlers live in stables were a regimented diet and lifestyle are enforced. When competing, wrestlers wear nothing but thick under wear like trunks, which can be grabbed for a handle. Matches are won by pin fall. These are only two of a myriad of martial arts that come from India, other forms of wrestling, weapons fighting and even a style performed on horseback could be described. With such an ancient and diverse culture there are probably even more that have gone into extinction and perhaps others yet to be developed.